The Commonwealth (a misnomer is ever there was one) is holding its Games in Glasgow this summer. The sporting jamboree will bring together athletes from across the old British Empire and (in the case of former Portuguese Mozambique) beyond it. There’s precious little wealth in common among the motley crew of nations made up by their former imperial masters and one thing that definitely doesn’t bind them is a shared understanding of human rights. At this year’s Norwich Pride, Vince Laws, Norwich artist and LGBT activist, will be highlighting the truly appalling record of many (actually most) Commonwealth countries in relation to LGBT rights. Vince’s illustration says it all. I want to protest the homophobia in the Commonwealth during the Gaymes. 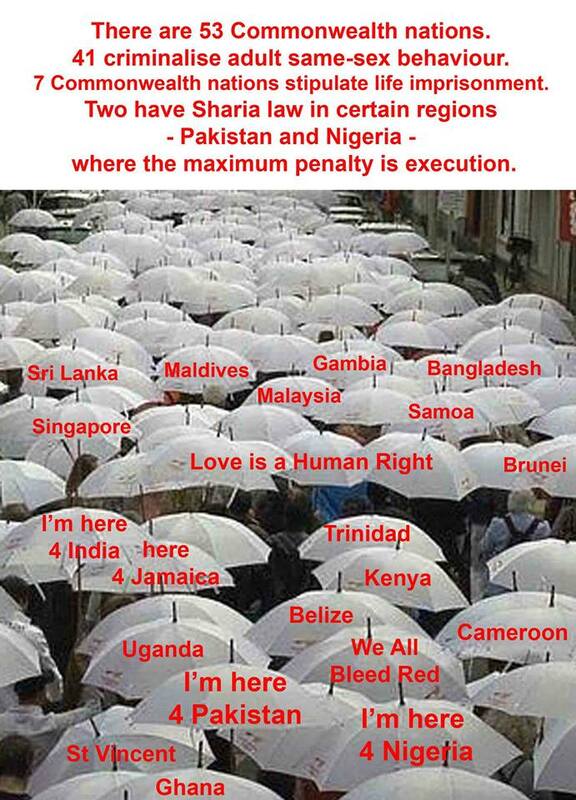 I want to get 41 white umbrellas, and paint the names of the offending countries on them, in blood red, and hopefully get 41 people to carry them in Norwich Pride parade. It’s going to cost about £5 per umbrella. I’m overdrawn and on benefits! To help, you could donate a plain white umbrella, send a fiver, a tenner, what you can afford. If I get enough money I’ll do all 86 countries where it’s illegal to be me. I’m hoping once the umbrellas are done they can go to different events around the country, or go on display… Any ideas, offers of help, welcome. So Vince is a doing a Rihanna by inviting you to stand with him under his umbrella (ella ella, eh eh eh). Offers of help and spare brollies to Vince on Facebook or chip in a few quid at Fundrazr. Ta muchly. . . pointed pointing! and an eye and attention grabber! It will probably rain as I’m going to be a volunteer (Clyde siders we are called), I’m going to be a first aider at the opening ceremony and rugby sevens. Rain seems to follow me wherever I go! !